12 Jan 2019 Dublin - Adam Kelly, aged 17, a 5th year student from Skerries Community College in Dublin, who used ICHEC's supercomputer for his project, has taken home the top prize for his project entitled "Optimizing The Simulation Of General Quantum Circuits". 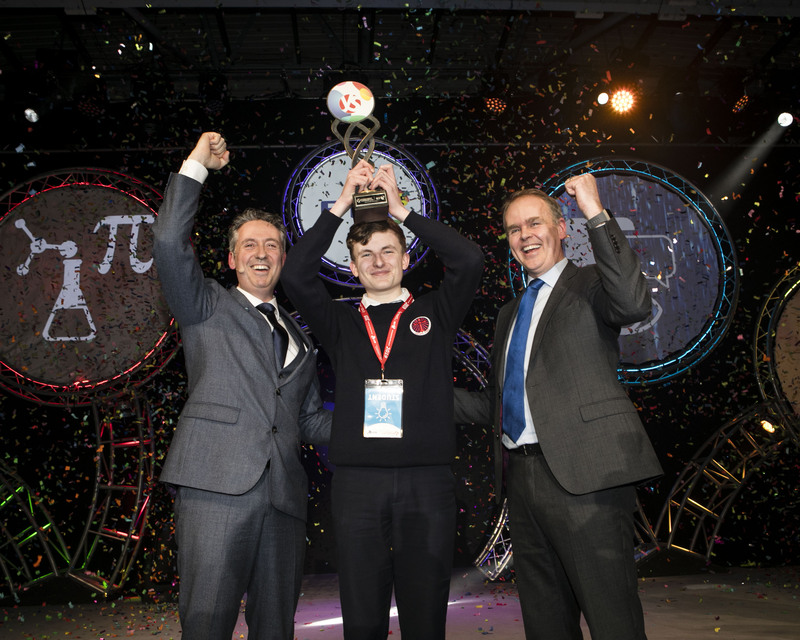 The coveted prize was presented to the winner on 11 January 2019 in the BT Arena by Minister for Education and Skills, Joe McHugh TD, and Managing Director of BT Ireland, Shay Walsh. Adam Kelly presented his project in the Chemical, Physical & Mathematical Sciences section in the Senior category. Adam Kelly's award includes the prize of 7500 euro and the BTYSTE perpetual trophy. In addition, Adam Kelly will represent Ireland at the European Union Contest for Young Scientists, taking place in Bulgaria in September 2019. Minister for Education and Skills, Joe McHugh TD, stated: "I am thrilled to be here at the BT Young Scientist & Technology Exhibition. The atmosphere of excitement, creativity and fun at the RDS has been incredible. I am particularly pleased to see so many young people tackling some of the most important issues facing us, from climate change to health, to technology, ethics and societal change. The students are a credit to their families, schools and teachers and they should rightly be proud of being here. They are a huge inspiration." "I'd like to thank everyone involved in the unique and brilliant event that the BTYSTE is; the organisers; the 81 judges; the dedicated teachers; and of course the mothers, fathers and families whose support is absolutely key to this." Shay Walsh, Managing Director, BT Ireland stated: "For 55 years the Exhibition has shown the ingenuity of Ireland's youth, and this year's Exhibition is no exception. The students at BTYSTE have sought creative and innovative solutions to some of the world's most pressing issues, and that spirit and drive is to be commended. We say "It Starts Here" at the BTYSTE and it really is only the beginning. From the young students involved in The Primary Science Fair to secondary students at the BT Young Scientist & Technology Exhibition, it is vitally important that every student's voyage of discovery does not end here." Speaking about the winning entry, BT Young Scientist Judge and Chair of the Chemical, Physical and Mathematics Category, Professor Sean Corish, commented: "Quantum computing is an emerging technology which represents a potentially significant advance in computing."